$10.00 Order of People's Republic of Bulgaria, 1st cl, Type 2, 1971 - 1991, lapel miniature in case. $10.00 Order of Maternal Glory, Third Class, Type Two. $20.00 Order of Cyril and Methodius, 2nd cl., with original issue case. $15.00 Order of Cyril and Methodius, 3rd cl., #3327. $10.00 Medal for Military Merit, est. 1950, circa early 1950s. Excellent condition; includes original suspension and old ribbon. $10.00 Medal for 15 Years of Irreproachable Service in the Ministry of Interior, est. 1964. Issued to policemen, fire fighters and, after 1969, to state security officers. Variant with different shield on the reverse and periods after letters "MBP". $15.00 Medal for 15 Years of Irreproachable Service in the Ministry of Interior, est. 1964. Policemen, fire fighters and state security officers' award. $20.00 Medal for 25th Anniversary of the Ministry of Interior, est. 1968. Brass, enamels, 2-piece construction. $19.00 1974 30th Anniversary of the Ministry of the Interior. $10.00 Outstanding Volunteer Policeman Medal. $20.00 Excellent Border Guard Badge, circa 1950s-60s. Very well made piece in brass and enamels. In excellent condition and includes original maker marked screw plate. $22.00 Medal for 25th Anniversary of Bulgarian People's Army, 1969. Excellent condition. $10.00 Certificate for Medal for 30th Anniversary of Bulgarian Army, 1974 issued to a Soviet citizen and filled-out in Russian. $20.00 Medal for Strengthening Combat Cooperation. $10.00 Medal in Commemoration of the 1300th Anniversary of Bulgaria, 1981. Excellent condition. $5.00 Georgy Dimitrov Centenary Medal, 1982. Excellent condition. $10.00 Kliment Okhridsky Medal for Culture and Education. $35.00 Badge of Excellent Employee of MVR (Bulgarian Ministry of Internal Affairs), with original case of issue, 1970s-80s. In near mint condition. $20.00 25th Anniversary of the Ministry of Internal Affairs (included Bulgarian State Security and Police). Brass, enamels. $10.00 Bulgarian Ready for Labor and Defense badge, circa 1950s. Excellent condition. $10.00 Veteran of Labor Medal. $10.00 Bulgarian Young Pioneers membership pin. $10.00 Bulgarian Young Pioneers Vigilance Award. $15.00 Bulgarian Naval or Merchant Marine Academy graduate's badge. 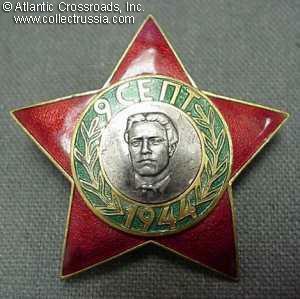 $10.00 Central Committee of the National Youth Organization Award badge for Military Valor. $5.00 Central Committee of the National Youth Organization Military Sports Athletic Award. $5.00 Excellent Volunteer Policeman Badge.